In this post we’d like to introduce you to the Cloud Assessment tool, a new feature on the NetApp Cloud Central web portal that helps in identifying unused AWS volumes and AWS snapshots that may otherwise go unnoticed. This blog will explore why you would want to zero in on unused AWS resources and data protection holes, show you how a Cloud Assessment can help pinpoint these problem areas, and give you insight on how to get more out of the cloud with NetApp’s Cloud Volumes. Before we get into the details about how a Cloud Assessment can help, let’s look in detail about why having unused AWS resources and holes in your data protection can be problematic. Amazon EBS volumes are block-level storage devices that are attached to Amazon EC2 instances as system drive or additional data drives. AWS EBS costs, both for volumes and Amazon EBS snapshots, are charged on a per GB per month basis. They are billed separately from compute, and charges will be incurred even if they are in an unattached or unassociated status. How do Amazon EBS volumes get unattached or unassociated? They are detached from Amazon EC2 instances in the event of instance termination or when the drive is attached to a different instance. In the event of an instance termination, even though the root volume is deleted automatically, it is possible that additional attached volumes will persist in an unused state. This behavior depends on the “DeleteOnTermination” attribute, which is set to false for non-root Amazon EBS volumes. These non-root volumes will remain in the cloud unless explicitly deleted by an administrator. It is quite possible that these volumes are no longer required at all, and yet they remain in your system, for which you continue to be charged. Amazon EBS snapshots are point-in-time copies of Amazon EBS volumes often taken as a backup of the system before making any changes or recovery points for future restore needs in case of failures. The first snapshot will contain the full copy of the data; subsequent snapshots will have only the changed data and reference to the previous snapshot containing the full data. The incremental snapshotting method provides storage efficiency to a great extent, but as the number of snapshots increase, the associated costs will also increase. Deleting an Amazon EBS volume does not impact the associated snapshots created from it. Hence, it is possible that an administrator will delete an Amazon EBS volume, terminate the associated Amazon EC2 instance, but the snapshots will be left behind for future reference or as backups for the instance. Ideally, these snapshots should be analyzed on a regular basis to identify if they are still relevant as time goes on. Since frequent snapshotting is a requirement for high levels of data protection, these snapshots can easily pile up, and include older snapshots that are no longer needed. However, until you delete these unneeded snapshots, you’ll still get a charge for them every month. How will these unused and unattached volumes and snapshots affect your costs on AWS? For example, say you have 20 basic magnetic HDD AWS EBS volumes of 100 GB and a monthly data change rate of 10%, and each volume has a snapshot. The snapshots could remain in the AWS cloud storage account and become irrelevant over time. These unused snapshots could increase your monthly bill by $110 (when calculated at a base rate of .06$ per GB for each snapshot per volume). If they are deleted at the right time, it could result in an annual savings of approximately $1,320. Pinpointing those savings is where Cloud Assessment comes in. Snapshots serve as the groundwork for AWS data protection. Amazon EBS volumes that lack snapshots are completely unprotected resources. That means if something goes wrong with your volume, you will lose all of the data stored in it. Even if you are running a system that can manage failover and failback processes, you will lack a solution for point-in-time recovery; without snapshots you won't have a way to return your system to a specific point in time if you had to do so. Meeting your system’s recovery point objective (RPO) requires regularly scheduled snapshotting to ensure that data loss is kept in line with the RPO in the event of a failure. But as Amazon EBS volumes are created on the fly, there may be an inadequate snapshot policy in place for those volumes. As the volumes continue to be used, they will store more and more data that is at continued risk for being lost should a failure occur. These kind of data protection holes ultimately may translate into business losses and operational setbacks. To avoid that, you can run a NetApp Cloud Assessment. NetApp Cloud Assessment highlights savings opportunities for unused volumes and snapshots in your AWS cloud environment and unprotected Amazon EBS volumes. The Amazon EC2 instances, Amazon EBS volumes, and associated AWS EBS snapshots are analyzed and the findings are presented. Taking a Cloud Assessment is easy. Once you go to the Cloud Assessment page, either log into your existing NetApp Cloud Central account or create a new one (signing up is totally free). You’ll then be prompted to enter your AWS credentials (note that none of your AWS key information is stored by NetApp). Once you’re inside, the Cloud Assessment tool will analyze your AWS deployment and provide you with the results. 1. Savings Opportunities: This portion of the report provides information on unattached Amazon EBS volumes, and unassociated Amazon EBS snapshots found in the analyzed AWS account. You’ll see an exact dollar amount of how much you will be able to save every year by deleting the unused snapshots and unassociated volumes the Cloud Assessment discovers. 2. Protection: This section highlights the data protection settings of your Amazon EBS volumes in terms of snapshot availability. Based on the snapshots associated with the Amazon EBS volumes, the Cloud Assessment will calculate the average RPO and the average number of Amazon EBS snapshots that are saved per volume. You’ll also be provided with the number of your Amazon EBS volumes that totally lack snapshots. A screenshot of the NetApp Cloud Assessment results screen. Cloud Assessment will also show you the benefits of using Cloud Volumes for AWS and how it can have a big impact on your overall cloud storage spend. With two different service levels—Cloud Volumes ONTAP which is user-controlled, and the fully-managed Cloud Volumes Service—choosing the best solution for managing data in the cloud is now up to you. With Cloud Volumes ONTAP for AWS storage you get all of the ease of an ONTAP system in the cloud with AWS. With NetApp’s signature storage efficiencies, the total amount of storage you consume is now easier to reduce. NetApp Snapshots also give you a higher level of data protection to guarantee your RPOs. 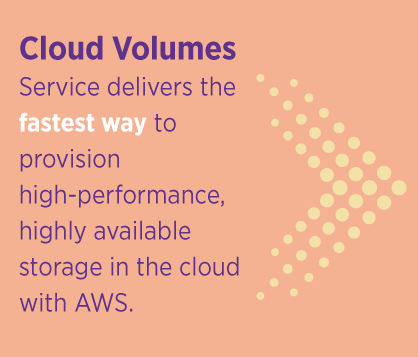 Cloud Volumes Service delivers the fastest way to provision high-performance, highly available storage in the cloud with AWS. Able to spin up 100 TB of storage in just seconds, all of your data protection and performance SLAs are guaranteed without any management on your side. You provision the resource, set up a snapshot schedule, and NetApp takes care of the rest—worrying about unused Amazon EBS volumes and snapshots will be a thing of the past. Whatever your state of cloud readiness, NetApp Cloud Assessment is just the first step to reducing your cloud storage spend. With the pay-as-you-go options available, it is quite easy to lose track of the storage resources that are lying unused since the individual charges would be negligible. However, this could lead to a buildup over time that would slowly eventually impact your company’s overall cloud storage charges. What can you do to stop the storage sprawl? 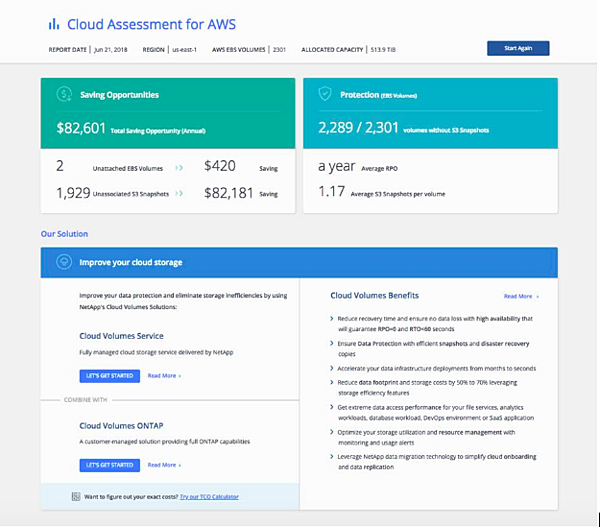 The NetApp Cloud Assessment tool on NetApp’s Cloud Central portal can help you reduce your cloud storage costs by providing insights into problem areas such as unused cloud storage and how they can be eliminated with the use of NetApp’s cloud solutions, Cloud Volumes ONTAP and Cloud Volumes Service. Get a firsthand look at best-in-class services for cloud automation, hybrid cloud storage management, and cloud cost optimization you control, and sign up for a 30-day free trial in AWS or a 30-day free trial on Azure today. Or go for the fully-managed, best-in-class data management service in the cloud and sign up for a preview of Cloud Volumes Service for AWS, Cloud Volumes Service for GCP, or Cloud Volumes Service for Azure today.